From left: Dep. Janniel DeJesus, Commissioner Betsy Arnold, Chief Dep. Jon Record, Sheriff Lance Benedict, Dep. Kathryn Stanziale, Dep. Dalton Cavanaugh and Kathryn Bommer, Geisinger Trauma Educator and Outreach Educator. 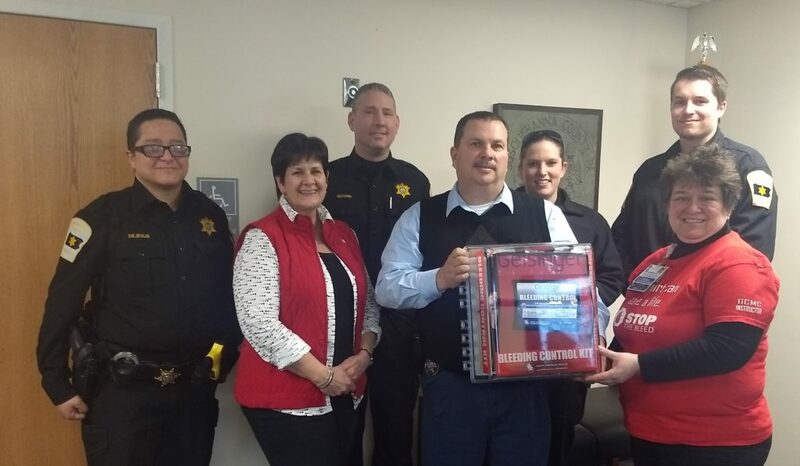 Susquehanna County Sheriff Lance Benedict accepted a public access bleeding control kit that will be installed in the county courthouse. The kit was presented by Kathryn Bommer, Geisinger Trauma Educator and Outreach Coordinator, on Thursday, Jan. 31, and came at no cost to the county, courtesy of a Geisinger Foundation Grant. Bommer has headed up trainings, including bleed control, for the county sheriff’s and probation department, as well as Game Commission Officers and local law enforcement personnel. She covers a six county area and has provided trainings for schools, churches, and government offices since October 2016. To date, she has trained close to 5,000 people on how to use the bleed control kit. “Every year the number goes up,” Bommer said. The effort to train more people to handle traumatic bleeding came out of Sandy Hook school shooting, Bommer explained. “It’s become the hop topic for public safety. It’s not an ‘if’ but a ‘when,;” she said. Bommer also noted Geisinger offers a free Bleed Stop app for cellphone users. The app can walk a person through how to handle a bleeding injury for a person until medical help arrives on a scene. The courthouse received a wall mounted kit. It contains a tourniquet, trauma dressings, compressed gauze, shears, gloves, an instruction card and a permanent marker. The Mountain View School District also received two kits, Bommer said, one for the elementary and one for the high school. 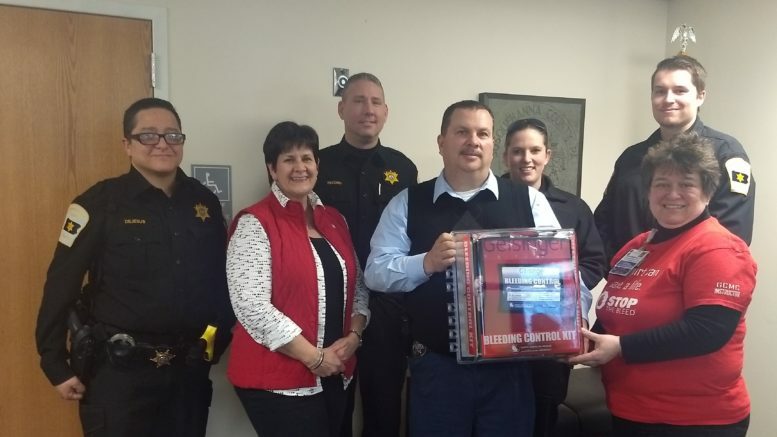 Be the first to comment on "Bleeding control kit donated to county"